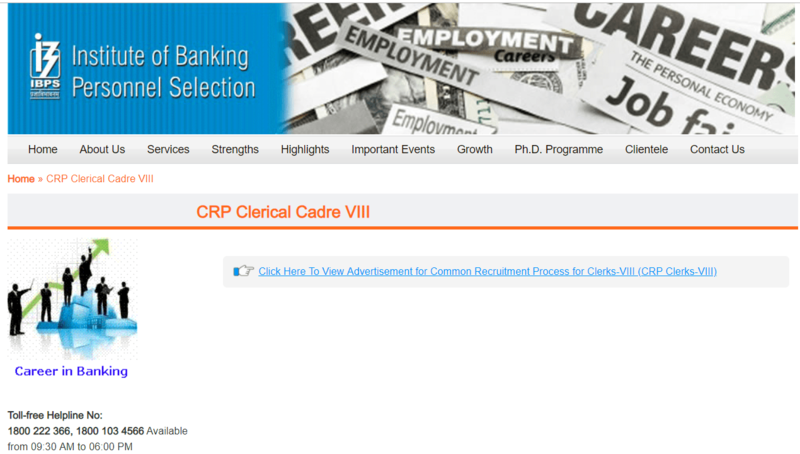 Institute of Banking Personnel Selection (IBPS) has Recently Announced about the Recruitment of 7275 Posts of Clerk CWE – VIII. A Large Number of Applicants filled their IBPS Clerk 2018 – 19 Online Application Form for these Posts. The Process of Submitting Online Application Registration Process is Started From the Date 18.09.2018 to 10.10.2018. Candidates Can Check All the Detailed Information about the Recruitment from the Below Provided Link……. Institute Of Banking Personal Selection eminently known as IBPS has organized Clerk Online Pre Exam. As the Selection Process is changed by IBPS, so Preliminary Exam was conducted First then Mains Exam will be Conducted. IBPS decided the hold the Pre Exam on 08, 09, 15, 16 Of December 2018. IBPS Clerk Mains Exam Date Was conducted on 20 January 2019. To become a Clerk in Public Sector Bank, candidate first need to gave IBPS Clerk 2018 – 19 Online Pre & Mains Written Exam. As Per Official Notification, Preliminary Exam is of Qualifying Nature. Marks of Mains Exam will be counted for Final Selection. Merit List & Allotment is also provide based on Marks in Mains Exam. ( 1 ) First Candidates Need To Open https://ibps.in/. NOTE : Cut Off Marks will be State Wise. So Based on Vacancies Cut Off Marks may vary by (+/-) 05 Marks. It is Expected Cut off Marks. Actual Cut off (decide by IBPS) for Written Exam may be differ or around the figures we suggest. Candidates have to attain minimum cut off marks for qualify for Selection. Lacs of Aspirants appear in IBPS Clerk Exam 2019. Result of IBPS Clerk is Totally based on the cut off Mains marks. Candidates who get marks more than Cut Off Marks in Mains Exam are eligible for Selection. Official Main Exam Cut Off Marks Has disclosed. You Can Check Below. At First Visit Official Website of IBPS (www.ibps.in). On Clicking that link you will redirect to IBPS Clerk Exam Result 2018-19 Page. You can check Your IBPS Clerk Exam Result by using your Registration Id OR Roll No. with Date of Birth. You can check IBPS Clerk Mains Exam Marks 2018-19 in the Same way, when available on website. Candidates be in touch with the Official Website regarding IBPS Clerk Mains Exam Result. We will provide latest information Here. So, keep visiting this page to get the Admit Card and Exam related information. Latest Updates are also available on our website (www.jobriya.com). You just need to Bookmark our website & visit regularly for updates. Candidates can leave their Queries in the comment box. You can Share Your Attempts in Clerk Pre Exam 2018. If you have any query about this Post please share with us. Our Panel will try to solve your query. Any idea about expected result date of niacl-ao and clerk mains? Sir you have mentioned expected cutoff for unreserved category for mains is around 48.89 for MP . How is the calculation performed ? If I am correct obtained score divided by 2 is the formula . Will SBI result impact the scores in IBPS clerk Mains ? When score card will be available? and any idea about mains cutoff for OBC based on lat year? When will ibps clerk 2018 result will come ? Tanya The Result Will Be Declared in January Month…….Keep Visiting This Post To Get The Upcoming Alerts……. ibps clerk mains result will be released on 1st april 2019. Yes IBPS clerk Result has been Declared. Mains Exam is on 01.01.2017.
wat do u mean by chance? Mam according to u what will be the expected cut of marks of m.p. state??????? ?